These are the first Pictures of the table that I am building. Comment's are most welcome. Hey Fabrica, we need more pictures! The little bit I see so far looks okay. I notice that your welder is using the typical "welder's logic" when working out his sequence - it is not the same sequence as in the drawings. 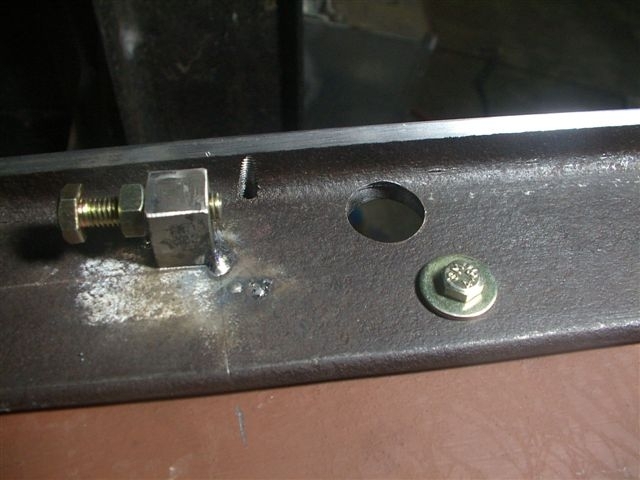 The typical welder's logic is to weld the biggest parts first and then to add the small parts to the big lump. I have learnt over the years that this is not the best way, because it is difficult to turn the big lump over into the correct position to make the best welds. The guys will weld overhead and vertical instead of turning the whole thing over to work with horizontal welds. The logic in my drawings is the reverse - first weld as many small parts into sub-assemblies as possible. Leave the big assemblies for last. For example, it is much easier to weld the foot onto the leg while you can turn the loose leg with just one hand. (3" x 1.5" U channel)on to the spoilboards. Drilled The perimeter holes on the spoilboard to go through the U channels underneath. Mounted aligned and tag welded the big longitudanal U Channels (6"x3') on to the samller U channels (which were initially fixed on to the spoil board) and turned the the whole thing upside down. 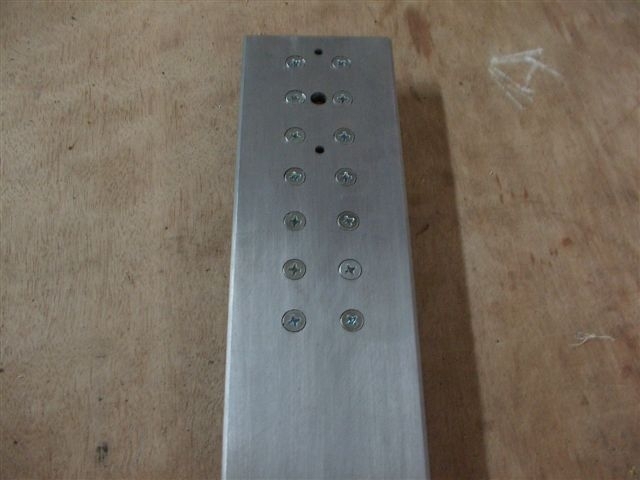 While in this postion I intend to drill 12 mm holes through smaller U channels through the bigger U channels and then run bolts through the holes and grind off all welding tags. Yes, The angle cuts came in really handy. Other wise getting the holes aligned on the U channels would have been really difficult. Today I will insert the bolts and remove all tags and hope to finish the legs as well. 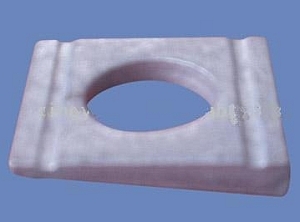 Where would you need a tapered washer ? Why not use guided endmill (Cutter used to make groove for Allen Key Bolts) to dress up the taper U channel and use sipmle wahers instead of tapered washers. Fabrica, you don't have to worry about the taper where the wood table is screwed to the cross-support - those joints are not so tight and those bolts are not highly stressed. Besides, the the taper makes a sort of ratchet action under the nut and that helps to "lock" it. I have cut the end's of the cross bearers to accomadate the legs made from 3"x1.5" U Channels. 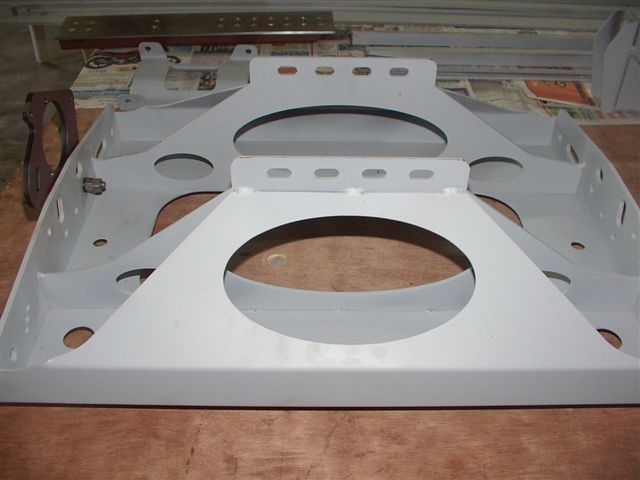 This is to ensure that the Supports, (drawing no 10 10 304 which connects the legs to the cross bearers)cross bearer and legs are aligned on a straight line. I will be replacing the existing washers with taper washers where it is required. Cross Bearer with ends trimmed. Cross Bearer with ends trimmed and foot welded. 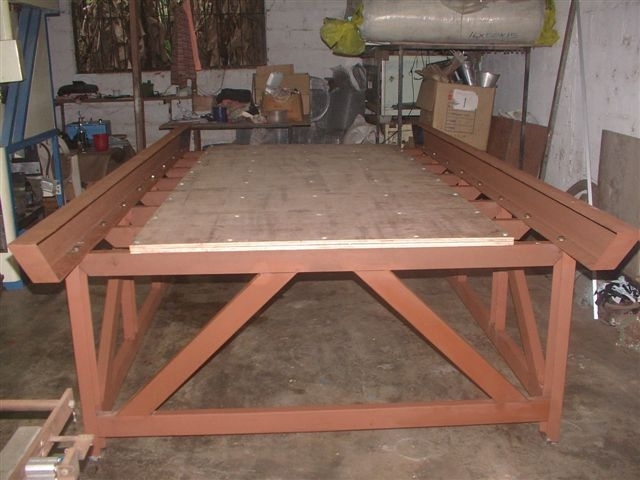 The other important aspect is to put the table off-center relative to the side beams, by about 100mm. Long explanation on the reason, but you'll have to trust me that it is a good thing to do now. Enjoy the weekend! I'm off till Sunday. In places where all six legs are getting mounted the cross bearer has to be trimmed. I hope to complete this work today and do up the cross supports for legs tomorrow. The under side of the table is almost complete. 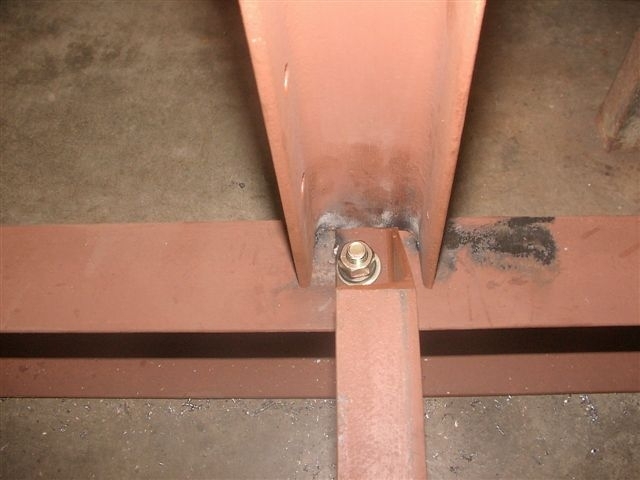 Are you still going to use the bolts, or will you just weld everything together? Fabrica, nice going, as Gerald said very robust. I see you are building on the floor, how do you avoid building in twist into the frame or are you not worried about that and will just shim the rails until they are all in the same plane? 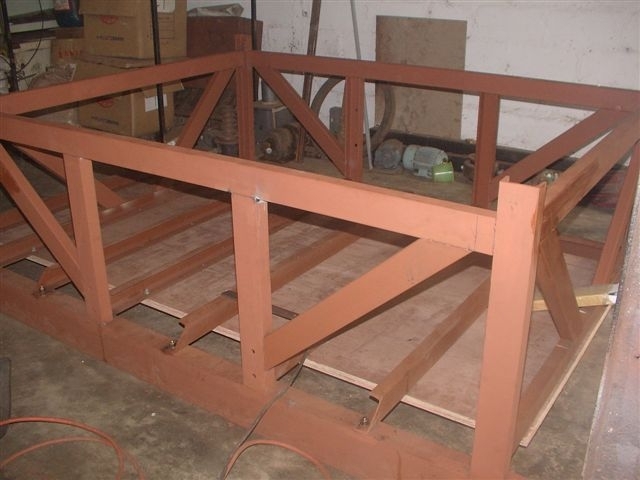 To avoid problems with uneven floors I have built myself trestles with adjustable tops so that I can get everything in the same plane. Using a laser level makes it all easier. Currently using them to build roller conveyors but will also come into use when I start on the Mechmate. Gerald, Some Joints would be bolted and some would be welded. Everything to be done in such a way that the side weldments could be separated once the cross bars (which are bolted to the Bog C Channel) are removed. 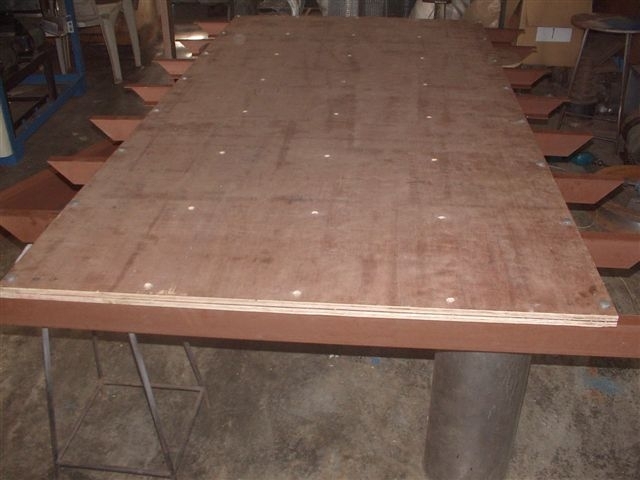 This is to ensure that the table could be dismanted and transported if the necessity arises. Allen the floor is fairly even and we have made the final adjustments by inserting shims between the floor and the table befre we started the final fixing. I will upload more photos in another few hours time. The table made to stand on it's feet after all works on the table underside was completed. Allen, Thanks for your input. I made the table to stand up on its feet. I checked the table for twisting. It is ok. The two big longitudanal C channels are virtually parallel to each other. The error is around 1 mm end to end. I checked the diagonal distances they are perfect. The toip surfaces of the Diagonal C cahnnels are on the same plane (No errors). Y + 430. I think I have made some mistake somewhere. But I assume this error is within the tolerance levels. 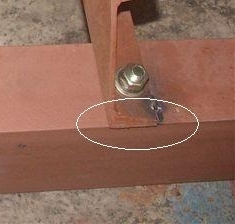 The cross-support should not have reached the edge - there should have a space of 5mm. Don't worry about that tolerance. Is all the material underneath C-section? If so, your table should twist quite easily if the top is not completely flat. You can just put some shims under one foot. 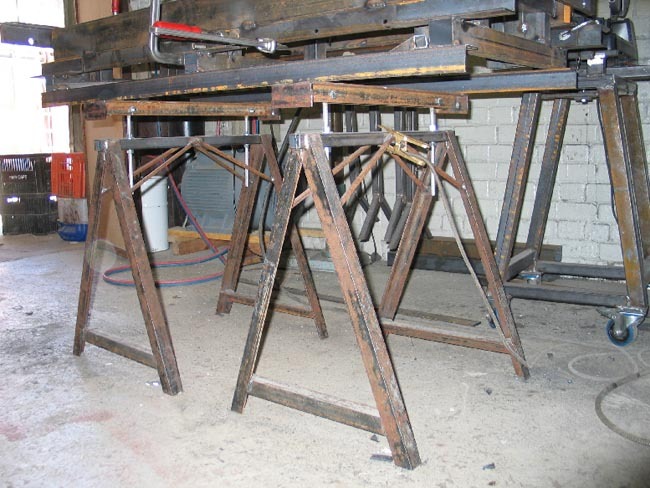 If you use tubing (square or round) underneath then it is not so easy to twist the table after welding. Yes Gerald you are dead accurate about Where I have gone wrong. What you have mentioned in the other paragraphs is not clear to me. Can you explain a bit further. Are parts 10 10 306 and 10 10 312 made of closed box-section or open C-section? C-section twists easily, box section (pipe) does not twist easily. You don't have any problems, that is a very solid table. However, if you look over the tops of the two rails and they are not parallel then there is a twist and you want to correct it. It is easy to correct with open C-sections because you can just put a piece of thin plywood under one foot and the other 3 feet will still touch the floor. 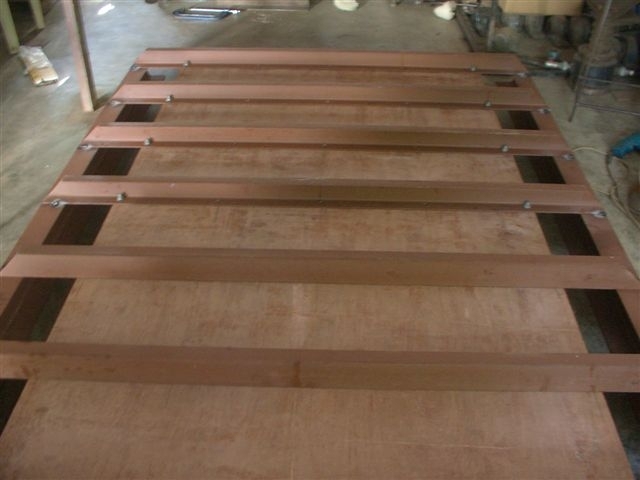 If you try the plywood spacer with a table made of box-section (pipes) then another foot will also lift off the floor because the table is stiffer. 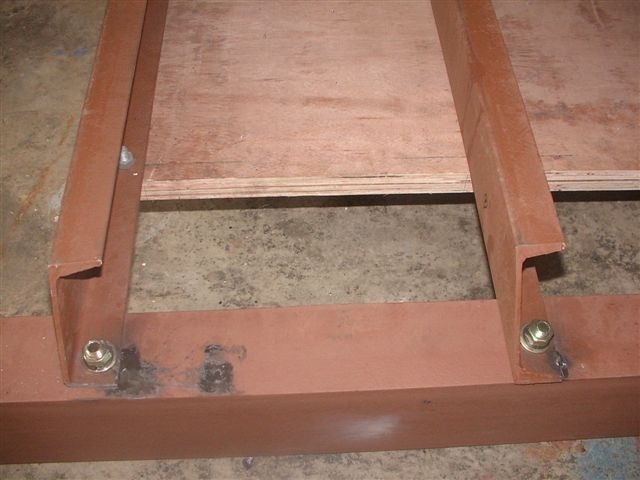 To twist such a table you can screw the feet to the floor and pull it flat. Both parts are made from Square box sections having dimensions of 2"x1" and thickness of 3 mm. The C channels onto which the Rails are going to be mounted have no twist at all and the top is flat. Fabrica, my eyes are deceiving me....all the pieces look the same size as the legs and cross-supports which are 3"x1.5". They do not look as small as 2"x1"??? Therefore I was assuming you used the same channel everywhere. If that is 3"x1.5" box section then you win the prize for the strongest table so far! Let me re-check again tomorrow morning and conform everything. Too much of dimensional stuff has gone through my mind during the last couple of days. The 3 mm thickenss could be conformed even now. Gerald, today after finishing the underside we turned the table on it's legs. Believe me,even a elephant could walk on it. It weighs more than 300 kg. Hats off to you for the design. Gerald I checked on the table dimensions today. The box channels are 3"x1.5" and 3 mm thick. In fact all round bars in your drawings have been replaced with these box channels. The below picture shows how I have done one end of the x rail. Rail Bolted to table, rack mounting hole drilled and tapped, proxy hole drilled, stopper blocks welded and adjustment screw mounted. 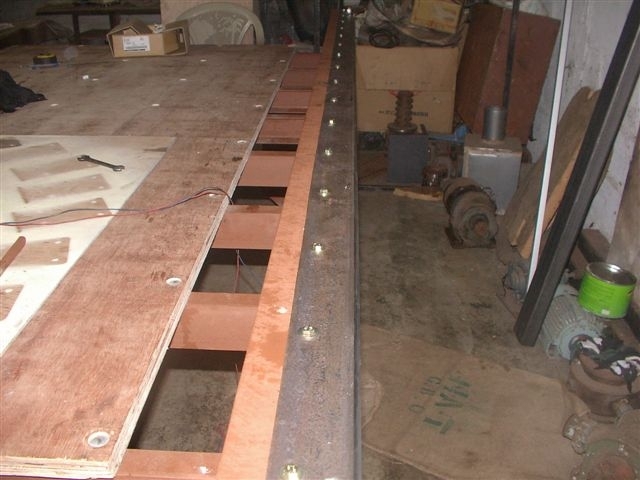 The below picture shows the X rails of the Mechmate bolted and aligned. Gerald,Please go thorugh the last two pictures that I have uploaded and see weather they are in order. I have done everything to the best of my ability. But with you being a experinced guy on this subject, you may observe some shortcommings in my work. Your suggestion accepted. WE will be doing more welding on the sides of the blocks. The blocks are ok not twisted, the picture is giving a wrong impression. I have finished the gantry today. Will post some pictures if possble now. Very tired after a hard days work. Just thought of Uploading some more picture of my project. I was supposed to complete the project by now. 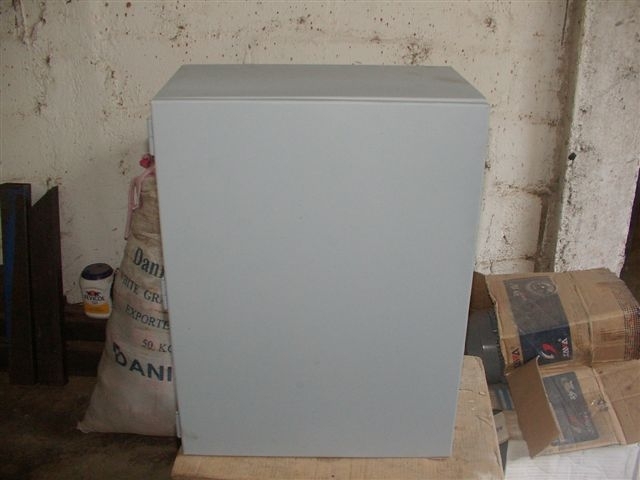 The major components which were due to arrive beofre Christmas has got held up due to the festive season. 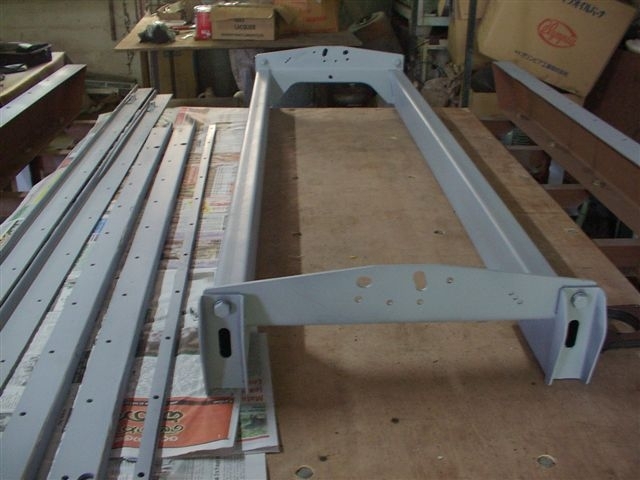 Below given is the Y car waiting for the final coating of paint. Gantry, XY rails and clamping strips completed.